Los Angeles has one of the highest rent growth rate forecasts for the end of the year, according to Yardi’s most recent report. 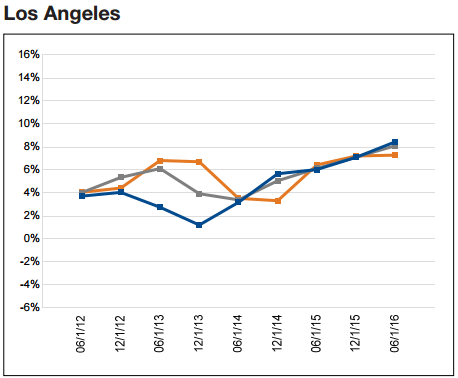 L.A. rent growth will reach 7.1 percent by the end of 2016, Yardi Matrix says, putting the City of Angels in the sixth spot for rent growth forecast. Real Trends recently recognized real estate’s best in its 2016 America’s Best Real Estate Agents list, breaking down California and L.A.’s best performing agents and teams by closed transaction sides and closed sales volume.